Standard cats are ceramic substrate and up to 2007 they were 400cpsi (cells per square inch). After 2007 in Australia they became Euro 4 which is 600cpsi and they also have a sensor after the cat to detect emission problems. Many European and Californian type cars became Euro 4 compliant many years before Australia. Changing to a higher flowing cat on Euro 4 compliant models will often trigger an engine light, which means Cheater tubes may need to be fitted, or a custom computer tune. Check the CheatRZ page for more info. Other cats are available in 300cpsi or 200cpsi, but the increase in performance is directly related to the CPSI. The bigger the hole, the better the performance. 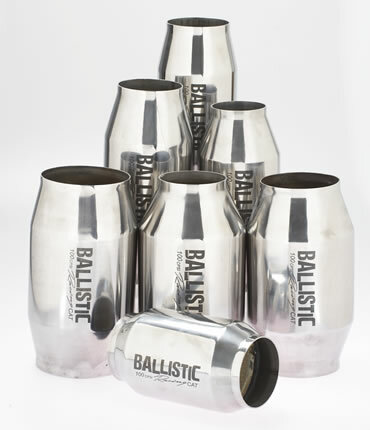 The internal holes in the Ballistic 100cpsi Racing Cats are 4 times the size of an earlier model, and 6 times the size of a Euro 4 model which translates into much better flow and performance. If your car performs better, and you drive for fuel economy, you will use less fuel. Changing to the Ballistic 100cpsi Racing cats will add around 5% of extra power to your vehicle over a standard cat. The increased power translates into fuel savings, which will pay for itself fairly quickly. The stainless substrate does not crack with impact damage like a ceramic cat. 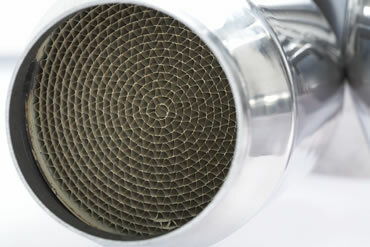 Better flow for high performance applications, such as Heads & Cam and Forced Induction – Turbo’s or Supercharger. 4” body is available in 2”, 2.25”, 2.5” & 3”. 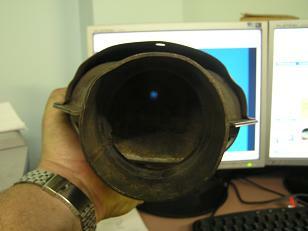 We also have one model which is 2.5” one end and 3” the other end. When we designed our Ballistic 100cpsi Racing Cats, strength was the most important feature, as we had many problems with other brands failing. 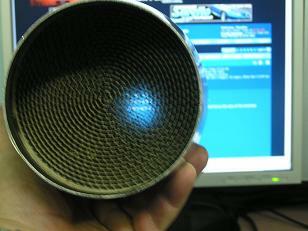 Our substrate is fully bonded to a tube. 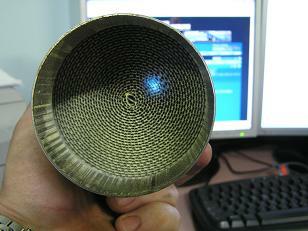 The tube is wrapped with an outer case and the 2 pieces are welded together. The tapered ends are then welded on. The outer case restricts the expansion and contraction when the cat gets hot and then cools down, and this stops the substrate from separating and coming loose. Our cats are much heavier than most other brands, and this means heavy duty quality. Some of the other brands are made from a single thin piece of tube, and the ends are spun down to a taper to hold it in place. The substrate isn’t bonded, and they rely on a series of tiny dents to hold the substrate in place. However, when the cat gets hot, the tube expands and the substrate comes loose. 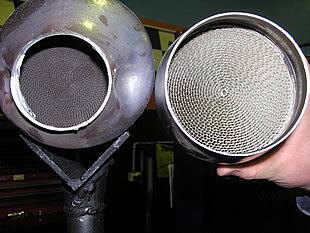 Each time the engine revs, the substrate is pushed back against the taper, closing off the outer cells. 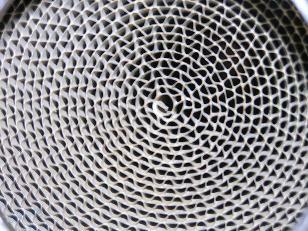 Before long, the cat is only breathing through the centre holes. This means performance suffers. We carry a large range of Catalytic Converters in stock, whether they be the Ballistic 100cpsi Racing cats, or standard replacement parts. This is a simple test showing how well these cats will flow by holding them up to a computer screen and looking to see how much of the computer screen you can see through each cat. 400cpsi Ceramic Cat - Same size as factory. 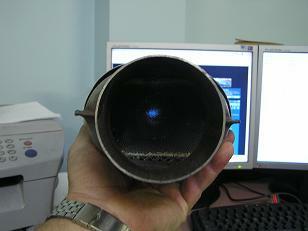 This shows a standard Ford catalytic converter compared to the Ballistic 100cpsi Racing cat.